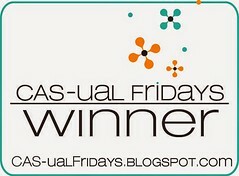 PE: Winner at CAS-ual Fridays Challenge!!! Winner at Winnie & Walter challenge!! Yay!! Hello! I was left with quite a few pieces of flowers and leaves after making this card I would send to a friend, so I thought of using them up. This card came about real quick, since all I had to do was arrange the already cut pieces and adhere them on the card! The flowers and leaves are all from Winnie & Walter In Bloom: Victoria’s Very Merry Flowers. I have this set of cardstock which is just perfect for watercolor effects, and images which are misted with water and stamped look especially pretty. 🙂 So, I first stamped several images from the stamp set onto this cardstock, fussy cut them and kept them ready. Like I mentioned earlier, the flowers are leftovers from another card I made. The sentiment comes from Winnie & Walter Wishing You. Sovushka Slavia CASEing challenge #21 – I mostly taken the concept of using flowers, the birthday theme, and the general layout of the muse’s, Svetlana Pavlova’s beautiful card. This entry was posted in Card Challenges and tagged #Cards, #CAS-ualFridaysChallenge, #HandmadeCards, #SovushkaSlaviaCASEingChallenge, #SovushkaSlaviaChallenge, #Winnie&WalterChallenges. Bookmark the permalink. BEAUTIFUL ..loved the watercolor effect with stamping alot ! Thank you so much Pooja!! Thank you very much Vijaylaxmi! Beautiful! Thanks for playing along at CAS-ual Fridays Birthday Challenge. Stunning! I love the layout and the watercolor look!! Thanks for playing along with us at the CAS-ual Fridays Challenge. Oh my! Love this card so much… stunning simplicity! Beautiful flowers!!! Thank you for participating from the blog of Sovushka Slavia! Thank you so much Haris! Straight love at first sight! What a cool! Thank you for participating in CASEing from Sovushka Slavia! Thank you so much Ekaterina!! Thank you so much Trina!! I am super happy about it! !